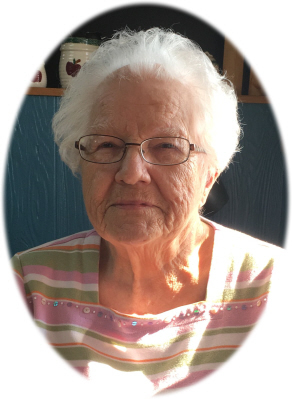 Clara Dorthea Perry age 94, of Elsie, MI, passed away Tuesday, October 23, 2018, at Union Court Assisted Living, St. Charles, MI. Funeral Services will be held at Smith Family Funeral Homes, Elsie, MI on Friday, October 26, 2018 at 11:00 A.M., with Pastor John James officiating. Burial will take place at Riverside Cemetery, Elsie, MI. Visitation will be held on Thursday, October 25, 2018 from 2-8 P.M. at the funeral home. Clara was born in Chapin, MI on January 12, 1924, the daughter of Hiram and Bertha Elizabeth (Hall-Washburn) Smith. She attended Chapin & Chesaning Public Schools. On August 11, 1943 Clara married Frank E. Perry at Chapin United Methodist Church. Frank passed away on March 19, 2009. Clara retired from Frankenmuth Bank and Trust. She enjoyed sewing, quilting, and baking. She enjoyed having family over and her cookie jar was always filled with chocolate chip oatmeal cookies. She was famous for making her sweet & dill pickles, strawberry jam, cinnamon rolls and macaroni and cheese. Frank and Clara were Chesaning Indians Football fans. Clara was a member of Trinity United Methodist Church Chesaning, MI. She is survived by her children: Cheryl Carter of Chesaning, MI; Ernest and Marianne Perry of Elsie, MI; Vicki Escamilla of Chesaning, MI; Beth Ann and Kevin Thompson of Merrill, MI; 12 grandchildren; 20 great grandchildren; and sister Effie Keck of Bannister, MI. She was preceded in death by her parents, husband, son Donald Perry, 2 sisters; Elizabeth Snyder, Hilda Coleman, and 6 brothers: Clarence Coleman, Lamont Coleman, Lloyd Smith, Harold Smith, Donald Smith, and James Smith. Memorials may be made to Trinity United Methodist Church, 1629 W. Brady Rd., Chesaning, MI 48616 or A&D Home Health Care, 3150 Enterprise Dr., Saginaw, MI 48603. Online condolences can be sent to www.smithfamilyfuneralhomes.com The family is being served by Smith Family Funeral Homes, Elsie, MI.